I’ve been pondering a lot about Martin Luther King, lately; more than usual. Every day, down at Liberty Plaza, I can’t help but think that, had he not been murdered, he would be with us. This was especially salient on Tuesday night, October 18, when I did the People’s Mic with Jesse Jackson. Whatever one thinks of Rev. Jackson’s politics, the man was an associate of the late, great Dr. King. The image of a young Jackson, standing to the right of Dr. King, on that fateful Memphis balcony, is emblazoned on the collective conscious of all who revere justice. Barack Obama spews platitudes of reverence to King, yet enacts policies that would have the latter in fits of apoplexy. This president has received more money for his re-election campaign from Wall Street than any other candidate, in history, and the election is still more than a year away. This president has deported more than one million people, since taking office, in January, 2009. This president has expanded the murder machine of war, so that the US is killing innocent people, en masse, in Iraq; Afghanistan; Pakistan; Yemen; Libya, et al. The sabers of iniquity are rattling against Iran, now. Wall Street’s lackey must ensure that everyone join the IMF. This president has abrogated further the Constitution, vis a vis the First Amendment rights of the nation’s citizenry. This president has aided and abetted the capitalist class’s assault on labor. While he stole millions from the unions, promising to enact EFCA, he has appointed Goldman alumna to his cabinet. His big mouth was conspicuously silent, when Wisconsin begged for support, earlier this year. 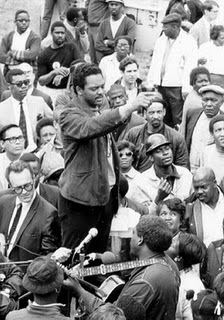 Let us remember that Dr. King, after being harassed for years by the very government which now seeks to siphon off of his legacy by dedicating a memorial to a fraction of the person, was murdered just hours after addressing striking sanitation workers, in Memphis. So, as I stand/sit/march/scream at Liberty Plaza, I cannot help but think that, if indeed there is another plain of existence to which we go, after our corpora expire, Dr. King is smiling down in solidarity on us, at Liberty Plaza, and shaking his head, in shame, at the Wall Street-Washington cabal that tries to usurp his great legacy. Arthur Smilios is an unapologetic anti-capitalist, musician rabble rouser. Arthur was the co-founder of the seminal New York punk band the Gorilla Biscuits. Since his days of performing “Cats & Dogs” (a song that encouraged thousands to adopt a vegetarian lifestyle) Arthur has strived to braid his art with his passion for social justice. The Sparrow Project has invited Arthur to continue to sound off on the issues he holds most dear through their blog on https://sparrowmedia.net . Arthur’s articles are written exclusively in his own voice, and may not reflect the views of The Sparrow Project. 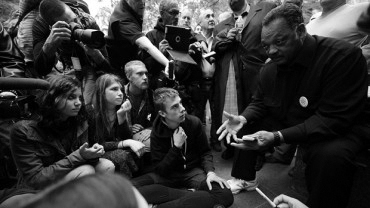 Tagged jesse jackson, martin luther king, occupy wall street, ows, solidarity.